A part of the American Trails Advancing Trails Webinar Series, “Now That e-Bikes Are On Trails, What Do We Know?” is a continuation of the 2017 webinar on e-bike access and management, designed to highlight “what we know” about e-bike use on paved, soft surface, and singletrack trails. The U.S. Senate voted Feb. 12 to permanently reauthorize the Land and Water Conservation Fund, an important funding source for conservation projects nationwide. The bill was introduced by Sen. Lisa Murkowski, R-Alaska, and Maria Cantwell, D-Washington, with a bipartisan list of co-sponsors. Though Sen. Richard Burr, R-North Carolina, is not included on the sponsor list, he introduced a related piece of legislation this month that also attempted to permanently reauthorize the fund. An Extended Horse Camping Weekend in Wild, Wonderful West Virginia at Camp Creek State Park & State Forest. 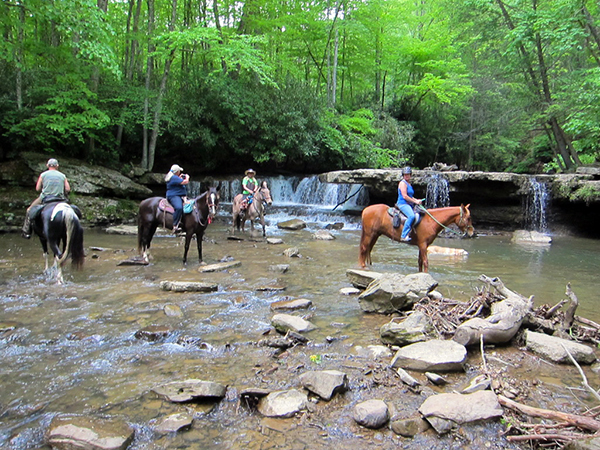 A beautiful horse camping facility named Double C Horse and Rider Campground is located in Camp Creek, West Virginia, situated within the Camp Creek State Park and State Forest. Reservations are required for this secluded and gated horse camping area separated from the rest of the park. Thirteen horse camping sites are available with open horse stalls and pens in a cul-de-dac surrounded by trees and bordered by a creek. Restrooms are also available. When public lands are blocked, Idahoans have no recourse. This bill seeks to change that. Idaho legislators on Monday voted to introduce a bill that would give the public the ability to file suit against someone who bars access to public land. The Senate Resources and Environment Committee voted unanimously to move Senate bill 1089 forward. The bill is sponsored by Sen. Fred Martin, R-Boise. On Wednesday morning, it wasn’t immediately clear when the next action on the bill would take place.